This new style of roller was designed to be easier to install and less expensive than your traditional backing roll. Each assembly comes with two shafts and a center roller. Once you have purchased the initial assembly, when it comes time to replace a worn backing roll, all you need to purchase is the center roller. These rollers are capable of being installed on any Model 60, 75, or Saber 75 slicer. Click here to view more details. This kit will help slicer operators when they need to adjust the lattice from one slice thickness to another. This also comes in handy when cranking your lattice open to blow out the crumbs...you know exactly which number to crank it back down to. Once the kit is installed and you have set up your numbers, you will know exactly what number to crank to each time. For example, if your 1/2" slice thickness is # 345 and your 5/8" is # 456, your operator will know exactly what number to crank to. Click here for more information. 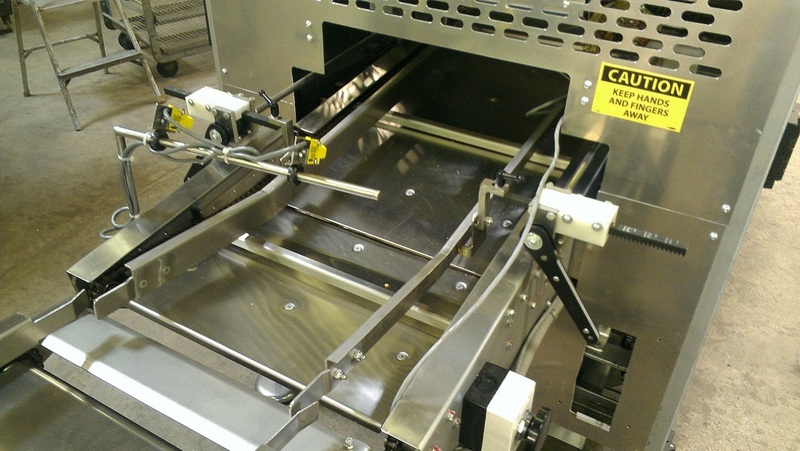 These new, ratcheting-style guide rails were engineered to be safer and easier for slicer operators to adjust. On the old-style rails, operators had to turn two star-wheels, one at the end of the slicer and one inside of the machine, near the blades, in order to adjust the discharge rails. Now, with our new safety guide rails, adjustment is done outside of the machine with one, easy maneuver. Click here to see more.